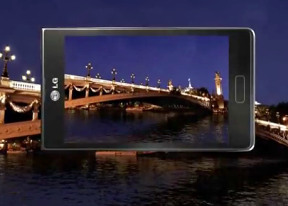 The LG Optimus L7 comes with a 5 megapixel camera, capable of capturing 2592 x 1944 resolution images. There is a single LED flash, but it won't be of much help in most low-light situations. While there is no hardwired shutter key, pressing the volume rocker will snap a photo. Of course, there's the virtual on-screen shutter button as well. The camera features are limited to geo-tagging, ISO setting, preset scenes and shot mode (normal, continuous shot or panorama). Face detection and continuous autofocus are available as well. In terms of image quality, the Optimus L7 isn't doing particularly well. The produced photos have a decent dynamic range and their colors are relatively accurate, but the noise levels are fairly high and there's not enough resolved detail. Here are a few shots we've taken with the LG Optimus L7. The LG Optimus L7 joins the long list of tested devices in our photo comparison tool. The page of the tool has information on how to use it. The synthetic resolution chart exposes the uninspiring resolving capabilities of the L7 5MP shooter. It's not the worst we have seen, but comparing it to the Samsung Galaxy W shows that a lot more could be achieved with a sensor of this resolution. The Optimus L7's 5MP camera is capable of shooting VGA (640 x 480) videos at 30fps, which is really disappointing for modern-day smartphone even in this price range. 1080p might be too much to ask, but all of the Optimus L7 competitors are easily doing 720p footage. The camcorder UI is basically unchanged from the camera one. In terms of options you can choose the resolution of the video, white balance, video quality and audio recording on/off. It's not just the low resolution either - the L7 videos come out oversaturated and with inaccurate colors. Their dynamic range is decent, but there's a fair amount of aliasing. Still it's unlikely that will be your biggest concern when showing videos to your friends. Here's a video sample we've uploaded on YouTube. And here is an untouched VGA@30fps video sample taken with the Optimus L7. The LG Optimus L7 comes with a wide range of connectivity options. It has quad-band GSM/GPRS/EDGE for global roaming and three-band HSDPA with 21 Mbps of download and 5.76 Mbps of upload. Wi-Fi is dual-band with b/g/n support, DLNA, Wi-Fi Direct and Hotspot capabilities. There is NFC and Bluetooth 3.0 too. The last connectivity option worth noting is the 3.5mm audio jack on top of the L7.